On Friday the EPA quietly released the EPA certification of the 60 kilowatt-hour Tesla Model S, giving the middle car in the Model S range a 208 mile electric driving range and a combined fuel efficiency of 95 MPGe. This certification was one of the gating factors before Tesla would begin production of this model, as announced on Tuesday the 60 kilowatt-hour model production date is expected to begin in Jan. 2013. The Tesla Model S is that company's second electric car, and the first car it has completely designed and manufactured on its own. It is a full size luxury sedan, with an all electric drive train. In November, the Model S was named Automobile of the Year by Automobile Magazine, and named Car of the Year by Motortrend. Unlike the other automakers Tesla plans to offer the Model S in three varieties: 85 kilowatt-hours ($77,400), 60 kilowatt-hours ($67,400) and 40 kilowatt-hours ($57,400), providing different driving ranges. Last summer the 85 kilowatt-hour Model S received a rating from the EPA of a 265 mile electric driving range, energy consumption of 38 kilowatt-hours per 100 miles (combined or city), 37 kilowatt-hours/100 miles (highway), and fuel efficiency of 89 MPGe (combined), 88 MPGe (city), and 90 MPGe (highway). The specs for the 60 kilowatt-hour Model S are 208 mile electric driving range, energy consumption of 35 kilowatt-hours per 100 miles (combined or highway), 36 kilowatt-hours/100 miles (city), and fuel efficiency of 95 MPGe (combined), 94 MPGe (city), and 97 MPGe (highway). From these numbers it is clear the 60 kilowatt-hour Model S is a more efficient car than the 85 kilowatt-hour model. That's likely because the 60 kilowatt-hour model will be lighter (the 60 kilowatt-hour battery pack will weigh a lot less), and additionally the drive train power is a little different between the two. The 85 kilowatt-hour model has a 362 hp (270 kW) motor, 325 lb-ft (440 Nm) of torque, a 0-60 time of 5.6 seconds, a quarter mile time of 13.7 seconds, and top speed of 125 miles/hr. The 60 kilowatt-hour model is a little lower, 302 hp (225 kW), 317 lb-ft (430 Nm) of torque, 0-60 time of 5.9 seconds, quarter mile time of 14.2 seconds, and top speed of 120 miles/hr. The slightly lower power levels will have contributed to the greater efficiency of the 60 kilowatt-hour Model S.
How does the 60 kilowatt-hour Model S stack up in terms of cost per mile of driving range, a comparison proposed by Coda Automotive last March? The 85 kilowatt-hour Model S, $77,400 for 265 miles range, or $292/mile of range. 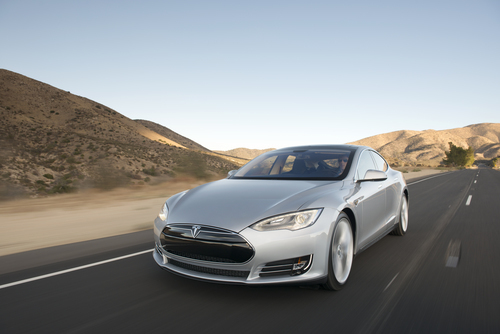 The 60 kilowatt-hour Model S, $67,400 for 208 miles range, is $324/mile of range. The other electric cars cost a lot more per mile of driving range. Tesla's website still claims a 300 mile driving range for the 85 kilowatt-hour Model S, and a 230 mile driving range for the 60 kilowatt-hour Model S. Why so, when the EPA ratings are so much less? A post on the official Tesla blog last summer explained that the EPA changed the test procedures from a 2-cycle test to a 5-cycle test. The 5-cycle test is more stringent and conservative than the 2-cycle test, and the EPA believes that test better represents real driving range. Tesla's blog post didn't explain why they would continue to post the 2-cycle test result, when the EPA certification is a for a much shorter driving range. The 40 kilowatt-hour Model S has not yet received EPA certification, and is expected to go into production in March 2013.